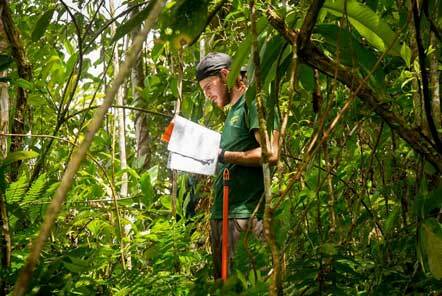 Volunteers who join our Amazon Conservation project in Peru support the centre’s conservation research and sustainable development projects and work on a combination of the projects during their volunteer placement. The Blue headed macaws are found in the forest reserve and they have been classed as Vulnerable on the IUCN Red List of Species and are threatened with extinction. The population is decreasing due to a combination of exploitation for the pet trade and loss of habitat through deforestation and increased human disturbance. 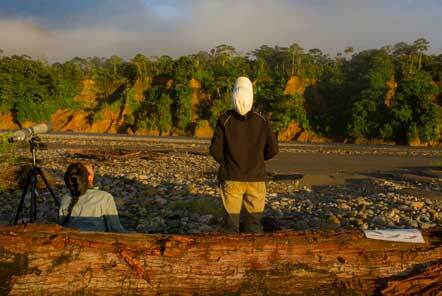 When working on this research programme volunteers take a short boat ride before dawn to the beach area where the small river cliff side clay lick can be monitored. 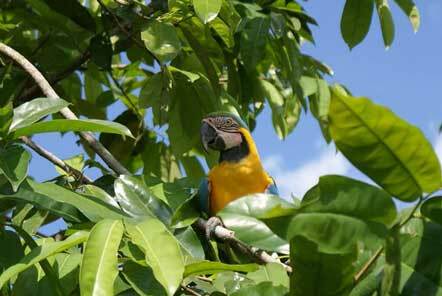 The team records the number and activity of the parrots and macaws and any observed tourist impacts. Each year the team builds an observation blind which they encourage visiting tourists to use to reduce their impact on the birds. 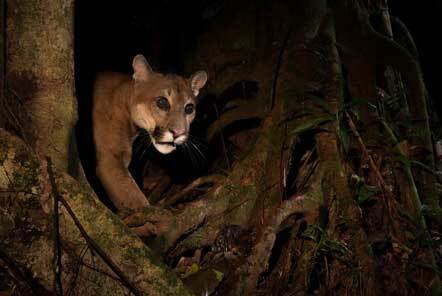 The mammal monitoring project investigates the importance of regenerating rainforest as a habitat for different mammal species, and this is achieved through a combination of transects, seasonal camera trapping and tracking. So far more than 40 large mammal species have been recorded at the field locations. The camera traps have recorded 13 individual jaguars at the field site since 2010. 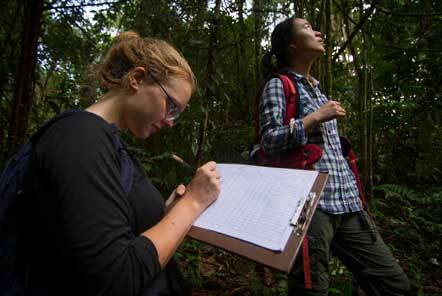 When required, volunteers help to set up camera traps in all 3 forest types, which allows for a comparison of encounter rates and relative abundances of species in each forest type. As salt is such an important commodity to all life in the Amazon rainforest the clay licks attract a lot of mammal species including tapirs (Tapirus terrestris), red howler monkeys (Alouatta sara) and white-lipped peccary (Alouatta sara). Mammal prints are recorded during morning surveys and through incidental sighting. The field site is a fantastic location for bird watching. Manu National Park is home to 10% of bird species globally so avian monitoring is a vital part of the biodiversity assessment across the different forest areas and can indicate specific pressures or forest types. 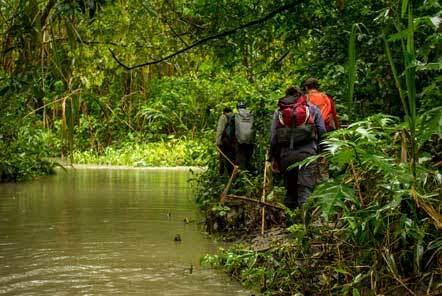 When scheduled, volunteers conduct early morning transects along the different areas and record bird sighting and calls. Bird species composition and diversity can signify many different forest elements, for example healthy populations of game birds such as guans, tinamous and trumpeters indicate low to zero hunting pressure, while the presence of the Harpy Eagle may indicate undisturbed primary forest. Amphibians are an excellent indicator species as they are extremely vulnerable to changes in their environment due to their very thin, moist skin which they use for gas exchange. This makes them very sensitive to chemical pollutants and also to changes in climate e.g. temperature and humidity. 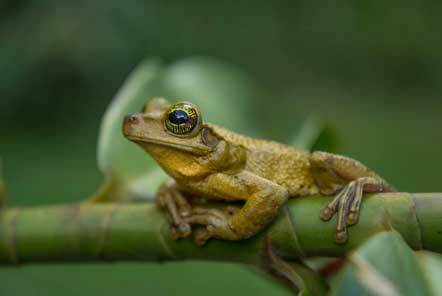 This means that amphibians are often one of the first groups of organisms to respond to changes in climate (or microclimate) caused by deforestation and other human activities. Reptiles are another important indicator group, as they are both predators (of small mammals, invertebrates, birds and amphibians) and also prey (to some birds, mammals and other snakes). This means that they support populations of higher predators and control populations of small mammals and other prey items. Many species of reptile are listed as data deficient and are greatly understudied so the team aims to improve the understanding of these important animals. Any changes in the food web can have substantial knock on effects which makes reptiles an important group to study. When assigned to a herpetology project, volunteers carry our transect surveys by walking slowly along a 100m trail through the forest looking for amphibians and reptiles on leaves, branches and on the ground. The research team also conducts pitfall surveys, which consist of four 20 litre buckets dug into the ground, joined together by a wall of plastic sheeting. The team has made some fascinating discoveries and found some species they believe may be new to science! Butterflies are significant bio-indicators and are important in ecosystems as pollinators to many plant species. They are good indicators of the quality of a habitat since they are sensitive to any changes. The project is creating an inventory of the butterfly species at the area and gaining an understanding of their distribution between the 3 forests types that differ in disturbance level. 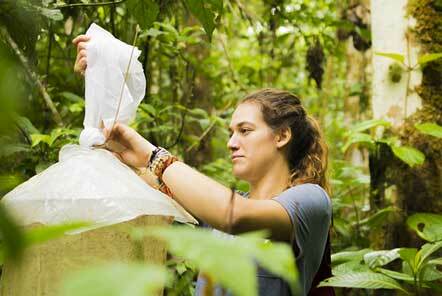 When assisting with the butterfly research project volunteers set up butterfly nets baited with fermented banana at 3 heights in the 3 main forest types. Butterflies are retrieved from the net and identified using field guides created from species previously found. The reserve where the project is based is in regenerated forest so the centre is a natural lab, made up of patches of regenerating forest with different human disturbance history. The team studied the undisturbed forest, which was a unique opportunity as much of the regenerating forest in the Amazon and around the world suffers from ongoing human disturbance that makes it difficult to measure how forests and their biodiversity can regenerate and recover. The forest regeneration project included leaf litter collection (where fallen organic matter was sorted), tree phenology and canopy photos. The data collected was used to monitor the changes in the biomass levels and data on carbon storage and sequestration of the regenerating forest so a value could be put on the forest under the UN REDD (Reducing Emissions from Deforestation and Forest Degradation) scheme. Many invertebrate groups, such as orchid bees and dung beetles have been are used as a focus in environmental disturbance studies due to their ideal characteristics as bio-indicators. For example, some orchids are entirely dependent on orchid bees for pollination and reproduction so studying their distribution was an important element in the tropical forests. Many dung beetle species show a graded response to various kinds of disturbance so studying them helped to assess the ecosystem health. Many species of dung beetle are found in areas where there is high mammal distribution. The project worked with the local community to create sustainable livelihoods and helped to improve the health and economic welfare of the families in the reserve while protecting and improving the rainforest environment. Biogardens – The project worked specifically with local mothers to combat malnutrition, by providing resources and knowledge to build biogardens that produce nutritious fresh food for families, and extra income through selling surplus crops. For families living in poverty on the poor soil of the floodplains, this extra source of nutrition and household income can make a big difference to quality of life. 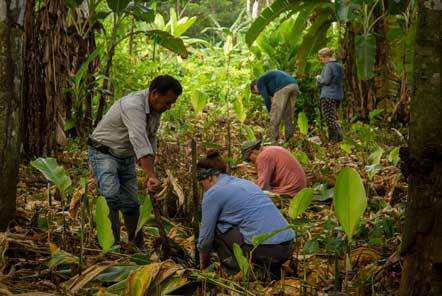 Agroforestry - The agroforestry project plots were planted with local farmers, and provided both short and long-term income using sustainable wood and banana production models. This was an environmentally sustainable alternative that protected the surrounding forest from illegal logging activity, encouraged species diversity, increased soil nutrition, and created carbon credits that can be sold to further support the project. Capacity building - With the booming tourism industry in Peru, the need for knowledgeable and motivated professionals who will work to protect the Amazon rainforest through eco-tourism is growing. The team worked with students from the local town, giving them the opportunity to visit the forest and participate in conservation research activities.